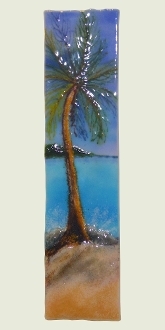 Kiln glass wall art. Beach scenes featuring palm trees or sailboats. Mounted on aluminum with wood back and are easy to hang from simple d-ring on back. 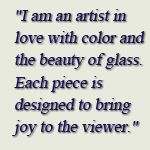 Created by hand from finely crushed and powdered glass so no 2 exactly alike. Signed by Anne Nye Each panel measures 5" x 20"
Panels are priced $188 each. Purchase any 3 panels and save $42. Use Coupon Code nye at checkout and $42 will be discounted from your order.